Sri Lankans must learn from history. For over 2000 years, Tamil Chieftains from South India have invaded Sri Lanka several times, and indeed temporarily occupied parts of the country. They were always beaten back. However, their remnants settled peacefully in the country. The Liberation Tigers of Tamil Eelam (LTTE) terrorist group, which has close links to organizations in the Indian State of Tamil Nadu (meaning "the Land of the Tamils"), even uses the tiger emblem of those ancient Chola invaders of Lanka. The symbolism cannot be ignored. The patient aspiration to take over most, if not all, of Sri Lanka has never died, and in the last century, taken various guises such as the pre-independence 50/50 movement, the proposed merger of the Northern and Eastern Provinces to form a "homeland" within a loose federation, and the terrorism perpetrated for the formation of a separate country called Tamil Eelam in a region of Sri Lanka that includes, and is bigger than, the Northern and Eastern Provinces. Thus, in dealing with the central issue faced, essentially the future of Sri Lanka as one island, one country, one government, we must consider the next centuries and millennia; not simply the issues facing the generations that are present today. The Tamil community of Sri Lanka has significant interaction with the Tamil Nadu State. The Tamil language, culture, Hindu religion, geography, similar caste structure and inter-marriage bind them closely. Tens of thousands of people from Tamil Nadu came to Sri Lanka as illicit immigrants ("kallathoni") in the fifties to the seventies. Sri Lankan Tamils either escaping or even fermenting the violence in the Northern Province have been able to land in Tamil Nadu easily and live there more or less at will. LTTE cells, supply bases, training classes, and naval operations running people and arms operate freely, except for rare police raids. Tamil Nadu politicians cannot survive unless they speak openly about Sri Lankan issues and in support of the positions of the WTM. Tamil Nadu MP's in the Lok Sabha are vociferous in their interference in Sri Lankan internal matters. Given that the homeland of Tamils exists in the form of Tamil Nadu, with a population of almost 70 million, one must question why another is needed in tiny Sri Lanka, unless the ultimate goal is amalgamation. The Sinhala people of Sri Lanka have no such connection with India. The Sinhala are an ethnic group that is strictly a Sri Lankan mix of many ancient migrations from Northern India, other Asian countries and aboriginal people, with no current common language, religion, or intermarriage with India. Both have legitimate aspects that help their claim to be a minority. Clearly, one cannot simply assume, as many NGO's and countries do, that the Sinhala need no protection of their rights, but that only the Tamils of Sri Lanka do so. Some would argue that it is the Sinhala who are an ethnic minority in South Asia, with no connections to any Indian State, and that they are the one's who require protection. The above aspirations are not so unrealistic if one considers a time scale of centuries. Indeed in 1988 the LTTE revealed the plans for a GTN when it invaded and tried to take over the Maldives. A small "victory" in the present era, such as a federal constitution for Sri Lanka, will be seen as simply a stepping stone to further "victories" in future. It is much easier to dislodge a "state" from a federation, than a land area that has no politically recognized boundary. The push for Tamil Eelam will continue to occur over the next decades and centuries, regardless of any new constitution for Sri Lanka that is signed by current Tamil leaders. Any one who believes otherwise is very naïve and does not understand history. The large numbers of Tamils who reside in Sri Lanka and think otherwise are a helpless but significant minority that is terrorized by the LTTE. With direction, funds and intellectual support from the WTM, the LTTE has killed thousands of people of all ethnic groups including large numbers of Tamils. It invented suicide bombings, used over 250 suicide bombers to kill mostly civilians, trains other terrorist groups of the world, kidnaps Tamil children, has mastered human shield tactics, runs an arms smuggling and drug selling operation through WTM ships, and collects enormous funds from Tamils of the world. It has murdered almost all senior civilian Tamil leaders of Sri Lanka as well as many leading Sinhala politicians. It is banned all over the world. It will never support even a true short term peace. It has used every lull in the fighting, formal or informal, to further its cause and prepare for future terrorist activities. While it is active, it will never allow moderate Tamil leaders to negotiate an agreement. Its real leaders are anonymous leaders of the WTM, mostly professional Tamils from the West who arm the active terrorists, provide intellectual support, carry on drug and arms smuggling operations, provide legal assistance, and mount massive international disinformation and lobbying campaigns. Only the WTM can cause the LTTE to stop its violence. The moderate Tamil leaders of Sri Lanka cannot influence the WTM with its vision of Eelam and subsequently the Greater (Vishala) Tamil Nadu. It is a fundamental mistake to assume that the LTTE is in control and is simply supported by the WTM. In fact the WTM has a long term plan, funds and influence, and its terrorist arm is the LTTE. The Sinhala majority of Sri Lanka made a fundamental mistake after Sri Lanka obtained independence from the UK, when it failed to a large extent in its stewardship of all minorities including sub groups such as Eastern Tamils.. The Sinhalese were misguided in trying to establish Sinhala as the official language of Sri Lanka. The majority has a responsibility to support the reasonable aspirations of minorities, even if the same minorities also make other unreasonable demands. 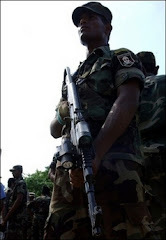 Body counts are not useful; nevertheless, it should be noted that the LTTE and other Tamil terrorist groups (the latter, by now destroyed by the LTTE) have killed in order of magnitude more Sinhala and Muslim and indeed Tamil civilians since the early eighties, in comparison to those killed by Sinhala thugs. It should also be noted that the majority of Sinhala people helped and protected Tamils in 1983 when such riots erupted in response to the first LTTE massacre of a vehicle full of soldiers. Tamil families are the witness to the support of the majority of ordinary Sinhala families that protected them at risk to themselves. The inability or unwillingness of the Sri Lankan Government of that time to prevent that violence is inexcusable. The 1983 incident, and the 1950's attempt to make Sinhala the official language are the two crutches that the WTM/LTTE keeps using to demand separation. I believe that Sinhala people, even the less educated classes, now recognize the foolishness and uselessness of such thuggery, as it is they who have had to prosecute the war through the "volunteer" armed forces. No current leader, group or political party would support such activities, given the price that has been paid, and the magnificent opportunity that was handed to the WTM/LTTE propaganda machine. Indeed, today's leaders of all parties would work actively to prevent such a situation. It is noted that there has been no violence from the Sinhala community for over a quarter of a century when they have been subject to suicide bombs and LTTE massacres of whole villages. The international community has not fully recognized that the WTM is similar to Al Qaeda. They are not concerned about the long term prospects for Sri Lanka in terms of future millennia. Many of these countries and organizations, including the Indian Civil Service, have been infiltrated by the WTM. For them, a ceasefire together with a federal constitution for Sri Lanka, with a separate state for the combined North and East will be a superb solution! They will not be around to suffer the consequences when the next round of separation begins in a few decades, from the new vantage point of a "state". Only the USA had banned the LTTE before September 11, 2001, even though front and leadership organizations such as the WTM and WTCC continued their work unabatedly. After September 11, 2001, others have done so too. Though even organizations such as the WTM are now in some difficulty Western countries have shown only half hearted interest in closing them down, due to their infiltration of political parties and organizations. Obviously, a major difficulty is that Sri Lanka requires development and military assistance from countries such as the USA and Japan. The Oxford English Dictionary describes a homeland as "an autonomous state inhabited by a particular people", while the Merriam-Webster Dictionary says it is "a state or area set aside to be a state for a people of a particular national, cultural or racial origin". An examination of the concept of a homeland in the context of Sri Lanka shows how untenable it will be. Imagine a homeland of a combined Northern and Eastern Province "set aside" for Tamils to essentially "inhabit" and be "autonomous" within Sri Lanka. First of all the Sinhala and Muslim people in the Eastern Province will not accept such a concept of combining a Province, in which they are a joint majority, with a larger Northern Province dominated completely by Tamils. Secondly, the majority of Tamils who now "inhabit" areas outside the so called "homeland, will want to continue to do so. Indeed hundreds of thousands of Tamils have voted with their money against the homeland concept by buying real estate in the Colombo District. That also indicates that they have put the 1983 incident behind them. There is no chance that they will want to "inhabit" the "homeland". Nor should they have to go to the "homeland". Thirdly and more recently, Eastern Province Tamil parties have come out against a merger. If the Northern and Eastern Provinces are the homeland of Tamils, are the rest of the provinces the homeland of Sinhala people? Muslims and Sinhala should be able to live freely in the Northern and Eastern Provinces. Tamils should be free to live in all provinces of Sri Lanka, operating actively in their language. The WTM wants a "homeland" in a major portion of Sri Lanka where only the Tamil language, culture and governance etc is extant, while they also want full and complete rights in all other parts of the country. That is not a sustainable solution. The only real solution is for all people to be able to live freely and operate actively in their own language, and practice their own culture, in all provinces of Sri Lanka. A referendum of course will not end in a meaningful finality: Sri Lanka cannot and will not endanger its sovereignty by allowing any third party to run a referendum. Thus a rejection of the joint sate concept will not be accepted by the WTM/LTTE on the convenient basis that the Sri Lankan Government rigged the election. On the other hand, the WTM/LTTE will do their best to rig the election by violent and other means. Thus a fair referendum will be impossible to hold. This is not stated from a view that a referendum should be held if it is possible to hold a fair one. The case has been made earlier that under no circumstances should a merger be even contemplated. In theory, human rights are guaranteed under the Sri Lankan constitution. However, given the national fabric has been torn apart since the 1980's by one of the world's most vicious terrorist groups, the LTTE, human rights in some cases have fallen into the cracks. That is no excuse and an independent judiciary, Attorney General, Police and elected leaders must ensure that human rights are guarded while also ensuring the rights of society as whole. Take the example of a terrorist who has parked a truck bomb. The only information available is that the bomb will detonate in one hour and that it is designed to kill about a thousand people. The terrorist has been apprehended. Injection of a 'truth serum' has not worked. Physical punishment meted out will elicit the required information. How are the authorities to balance the rights of the terrorist, against the right to life of the 1000 people? There are no easy answers to human rights issues and the only solution is to make an honest attempt each and every time to consider the balance of rights. Developed western countries, that are fighting a dirty war against the Al Qaeda under difficult circumstances, require our understanding. They must equally understand the problems facing Sri Lanka, a small developing country, as it struggles to find that balance while fighting an enemy with a worldwide network and organization. Sri Lanka's legal, governing and other institutions have not had the time to establish the traditions, just 50 years after 500 years of colonial rule, that, for example, a UK will have. In a forthcoming article, the writer will explore a possible future for Sri Lanka with ideas about a unitary country, active National language rights, new idea about Provincial language rights with asymmetry, Provinces with new rights as the unit of devolution, the key aspects to be controlled by the National Government, the Presidency, the military defeat of the LTTE, a renewed commitment to human rights, a truth and reconciliation commission, support for reasonable aspirations of Tamils, and a true multi ethnic armed force. "Centre concerned over LTTE activities"